Volunteers use a raft to rescue residents from their homes as they move along the Frontage Road near Texas Boulevard after heavy rains caused water to rise and flood neighborhoods on Wednesday, June 20, 2018, in Weslaco. WESLACO — The city commission unanimously approved borrowing $4 million for drainage improvements during a special meeting Tuesday. The certificate of obligation bond approved for drainage upgrades comes three months after a statistically rare flood damaged about 25 percent of homes within the city. Dozens of residents, who attended a city-held forum and city commission meetings following the flood, urged commissioners to act swiftly on drainage. The debt, incurred by the city to pay for costly drainage improvements, marked another step toward plans to convert parts of Harlon Block and Mayor Pablo Pena parks into regional retention facilities, engineered to hold and release floodwater during downpours. The city may also purchase land near Leisure World RV Resort and John Knox Village, for drainage improvements, according to City Manager Mike Perez. Leisure World RV resort residents, many over the age of 55, were flooded in June as well as in 2015, when the city also received a substantial amount of rain. A group of residents from Leisure World attended city commission meetings following the most recent flood, pressing leaders to find a solution that will keep water out of their mobile homes during storms. In June, more than 11 inches of rain fell at the Mid-Valley Airport in three hours, according to the National Weather Service. In the northeastern part of the city, more than 15 inches of rain flooded the area. “We need to address the antiquated drainage infrastructure that the whole Valley has. 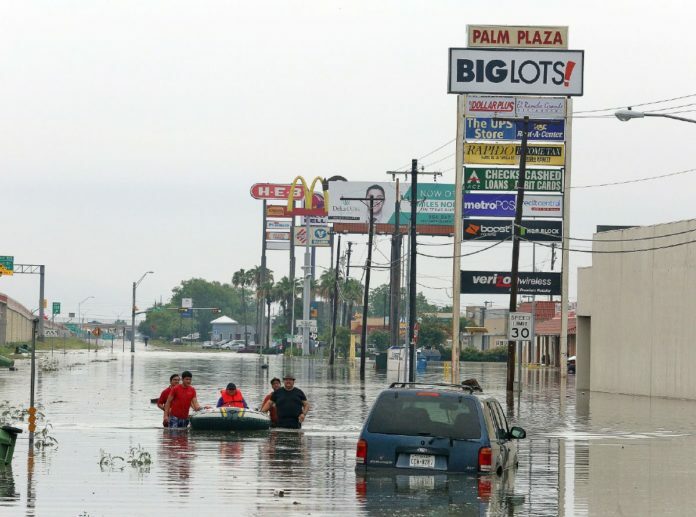 Weslaco isn’t immune to that, so it is needed,” said Mayor David Suarez. Other parts of the county, such as McAllen and Mission, also saw flooding. In 2015, Gonzalez De La Garza CFZ Group, a consulting firm, estimated there was $318 million worth of improvements the city could undertake to complete its master drainage plan. The price tag, however, is 12 times the amount in the city’s general fund this fiscal year. Instead of undertaking the costly improvements at once, the city commission narrowed its priorities, including moving to hire a firm to conduct a 2D modeling of the city’s current drainage infrastructure. The modeling technology would assist engineers in pinpointing where drainage improvements, such as adding larger pipes or regional detention facilities, will have the greatest impact. The city commission will likely also use the borrowed money, in part, to hire one of four engineering firms interviewed last week. The issuance of certificates of obligation, money borrowed from investors by local governments, do not need voter approval. The city commission may call for a bond election to be held in May, but the amount will be determined after the selected engineering firm completes its study. The debt incurred, through the certificate of obligation, will be paid off over 20 years, at a 3.385 percent fixed interest rate — the lowest rate submitted by bidders who lend money. Instead of raising taxes to cover the cost of paying off the debt, the city cut its budget by $140,000 this fiscal year, and the Weslaco Economic Development Corporation will contribute the same amount, covering the cost of the first $280,000 payment. “I was never too keen with raising taxes,” Suarez said. Hidalgo County Drainage District No. 1 called for a countywide bond election to be held in November. If voters give the $190 bond a green light, drainage improvements within Hidalgo County Precinct 1 will alleviate the city’s burden of having to pay for further drainage improvements, officials said. “If the county passes their bond, then they’re going to be able to do a lot of infrastructure improvements where our (city) ditches hit the county ditches,” Suarez said.